Centre stage of the annual Kataragama Esala festival shifts to Teyvani Amman Temple on the festival's sixth day with the temple's colourful Flag-Hoisting Ceremony. Recent improvements to the temple's infrastructure, services and administration also have been drawing favorable notice from inmates and public alike. Historically Teyvani Amman (Sanskrit: Devasena) and her traditions hail from North India where they are associated with Hindu monks of the Dasanami Order founded by Adi Sankaracharya in the 8th Century AD.  Myth and history combine to explain how Lady Devasena came from North India to Kataragama with a retinue of saintly servants. 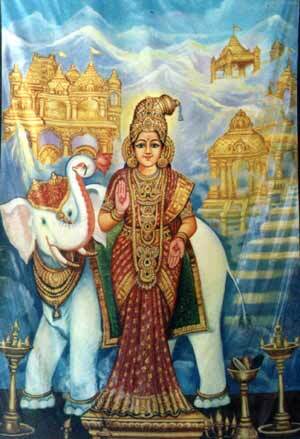 Centuries ago, it is believed, the Kataragama God's senior spouse Devasena was weary of waiting for her wayward husband Lord Skanda to return home from his long sojourn in Lanka. So she prompted the sage Kalyana Giri Swami to leave North India and come South to locate her lord and bring him home. The sage is said to have found Lord Skanda in Kataragama; he never returned to North India but remained and founded Teyvani Amman Temple. Since that time all three deities are believed to be happily settled in Kataragama. Kalyana Giri Swami thus became the founding abbot or mathadhipati of Kataragama Teyvani Amman Temple. Since that time the sampradaya of North Indian mathadhipatis has administered the Math and associated temples. 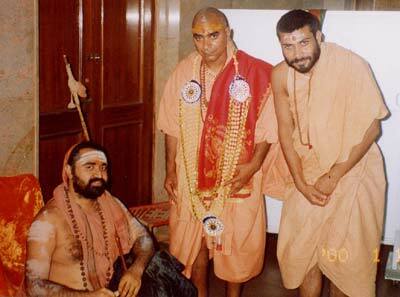 In January 2000 His Holiness the Kanchi Sankaracharya personally appointed two highly qualified North Indian Dasanami sannyasis, Purnanand Giri Swami (47) as Trustee and Mathadhipati and Vigyananand Ashram Swami (36) as Deputy Abbot, to continue the Dasanami succession of administrators. The resonant voice of the gifted and vigorous new mathadhipati now fills the kovils and matham once again to the delight of Tamil and Sinhala devotees, despite the fact that he is yet conversant in Hindi, Sanskrit and English only. 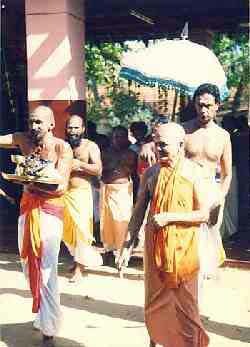 HH Kanchi Sankaracharya (seated at left) appointed Pūrnānand Giri Swami (center) as Mathadhipati and Vigyānānand Ashram Swami (right) as Deputy Abbot of Kataragama Teyvanai Amman Math in January 2000. 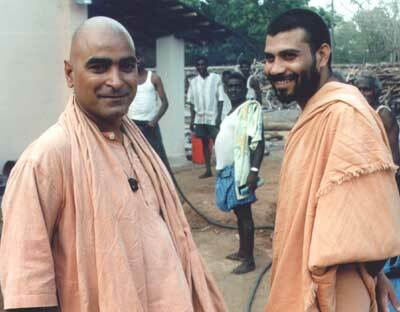 Mathadhipati Pūrnānand Giri Swami (left) and his deputy Vigyānānand Ashram Swami direct the Temple's large-scale cooking operation during the 2001 Esala festival. Among recent changes to the infrastructure of the institution, notable are the complete renovation and refitting of the Danasala with a sturdy new roof, ceiling fans and sanitary floor tiles. Annadanam is served in the traditional fashion of Jaffna Tamils with devotees seated on the floor taking meals from plantain leaves, but with the added feature of stainless steel serving carts. Annadanam is also served to devotees daily and to the public every Friday outside of the festival season. Not only Tamil Hindus alone but devotees of all communities, rich and poor alike, come in droves to avail themselves of the matham's excellent (and free) vegetarian meals, including wealthy urban devotees, Pada Yatra pilgrims, poor mothers with children, swamis, sadhus, fakirs and service personnel of the security forces. Over the centuries, many great souls like Kriya Yoga Babaji and Palkudi Bawa have been associated with the sacred setting of Teyvani Amman Temple. Devotees of Kriya Yoga Babaji will soon consecrate a shrine built upon the site where the master siddha sat in meditation under a great banyan tree many centuries ago as directed by his guru Bhogar Siddhar. 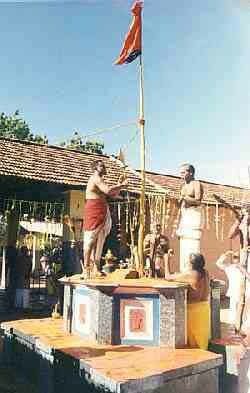 The Flag-Hoisting Ceremony at Kataragama Teyvani Amman Temple takes place on the sixth day of the Esala festival. On the same day a Flag-Hoisting Ceremony also takes place at the Ishwara (Siva) Temple, signifying that the Esala festival is now in full swing. "Hindu Temple Worship" by HH the Kanchi Sankaracharya. For more information about Teyvayanai Amman Kovil and Matham, e-mail to D.M. Swaminathan dmswaminathan@gmail.com.